Please note a typo on the flyer...Workshop is from 1 to 5pm! Mahalo! 1. Discover the lay of the land - Emotional Anatomy - Where the Breath lost its way - Muscle whispering. We will train our eyes and hands to see and touch in new ways. 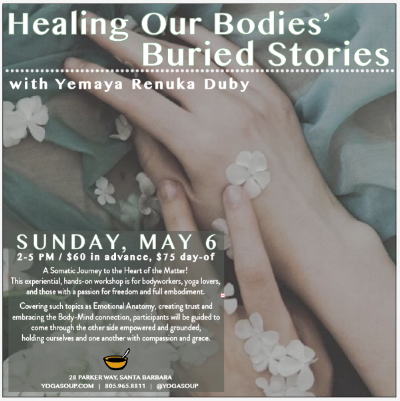 Yemaya Renuka Duby marries within her path an eclectic and rich background in Earth-based traditions, Eastern devotional practices, and European wisdom. A Rosen Method Practitioner since 1995, closely trained with founder Marion Rosen, Yemaya has helped hundreds of patients move from physical pain, past trauma and emotional struggle to conscious choice, freedom of movement and empowerment. Balancing precision and understanding of the body with heartfelt presence and spacious guidance, she allows for each individual’s innate power of healing to activate and lead the way. thank you so much for organizing this! and for your amazing workshop. I haven't felt this calm and at peace in YEARS. Bless you "
"Thank you for your session yesterday - it was significant, to say the least!!" "Powerful work, thank you! "